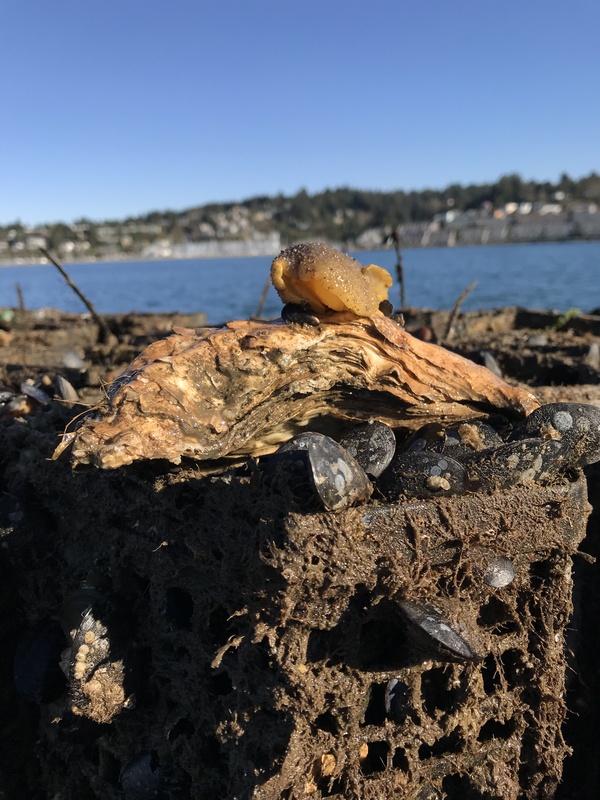 Blaine's photo is of a Lemon nudibranch and mussels, just two of the many animals that utilize oyster cage structure for habitat on Molluscan Broodstock Program rafts in Yaquina Bay, OR. 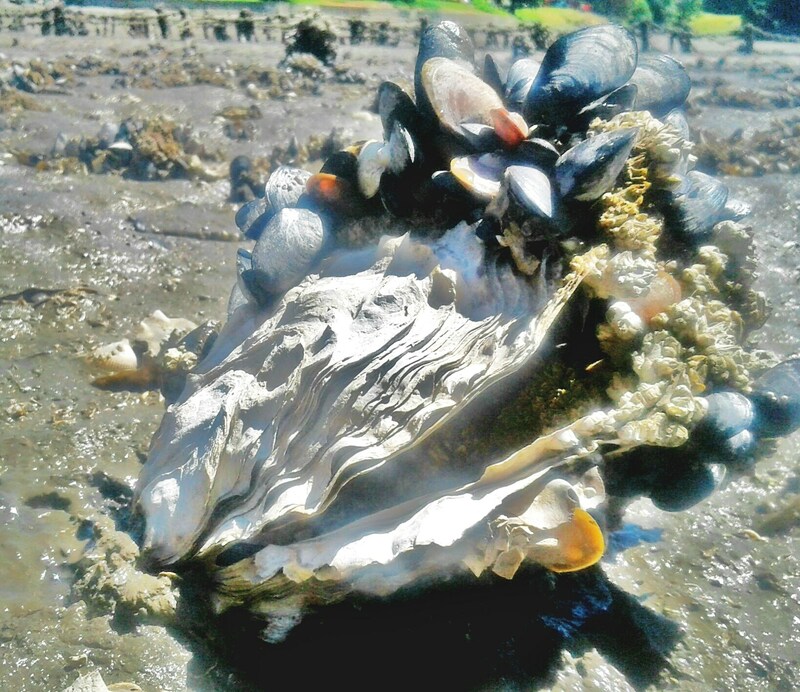 Something caught de Witt's eye while inspecting Manila Clam beds. A fish had laid several eggs in one of the panels that covers and protects the clams. They stood out from the rocky beds in the light of his headlamp, otherwise he might never have noticed them. This juvenile sea otter Weatherly call Scuppers. He is missing a front paw which probably would have doomed him if he hadn't figured out to befriend her and her co-workers. Scuppers spends his days close by their farm boat eating all of the urchins, crabs and mussels that are washed out their boats as they clean and harvest their oysters. Everywhere they go Scuppers follows for a meal. He went from a skinny starving otter to plump and healthy. Weatherly says they are very happy this little guy found them. Photo taken in Homer, Alaska. Under this mat of green macro algae (Enteromorpha sp) lies this year’s crop of yearling single Pacifics. The oysters consume phytoplankton, and excrete feces, pseudo feces, and ammonia in a mixture that serves to fertilize this luxurious crop of seaweed. 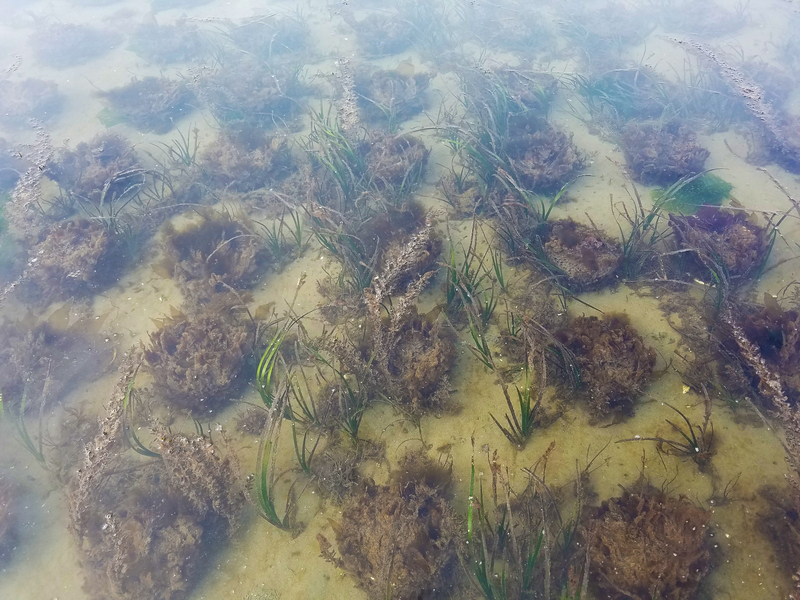 The lush crop also provides habitat for crab (graceful crabs mostly) and fish (shiner perch, stag horn sculpin, and bay pipefish). 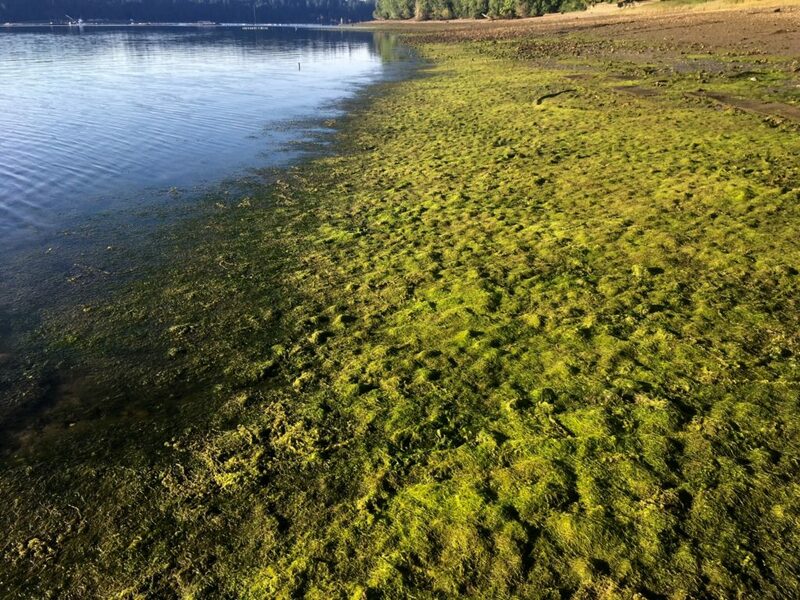 The downside of this heavy growth is a mat that makes oysters grow slower, clams come to the surface of the beach and can’t dig themselves back in, and likely oxygen debt as the algae naturally dies and decomposes. Margaret's photo shows how oysters provide valuable structure and habitat. 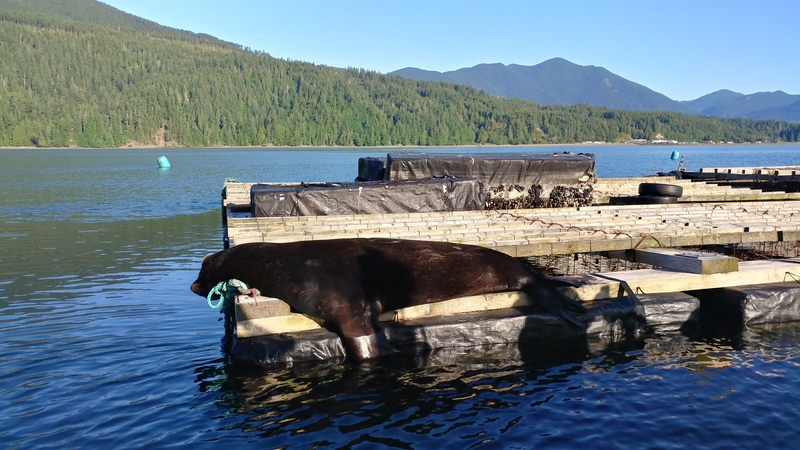 Dillon's picture shows a large Stellar sea lion hauled out on a mussel rafts in Quilcene Bay, WA. Shellfish rafts play an accessory role as a safe haul out site for marine mammals, one which is away from beach disturbances and provides quick access to the water for feeding. 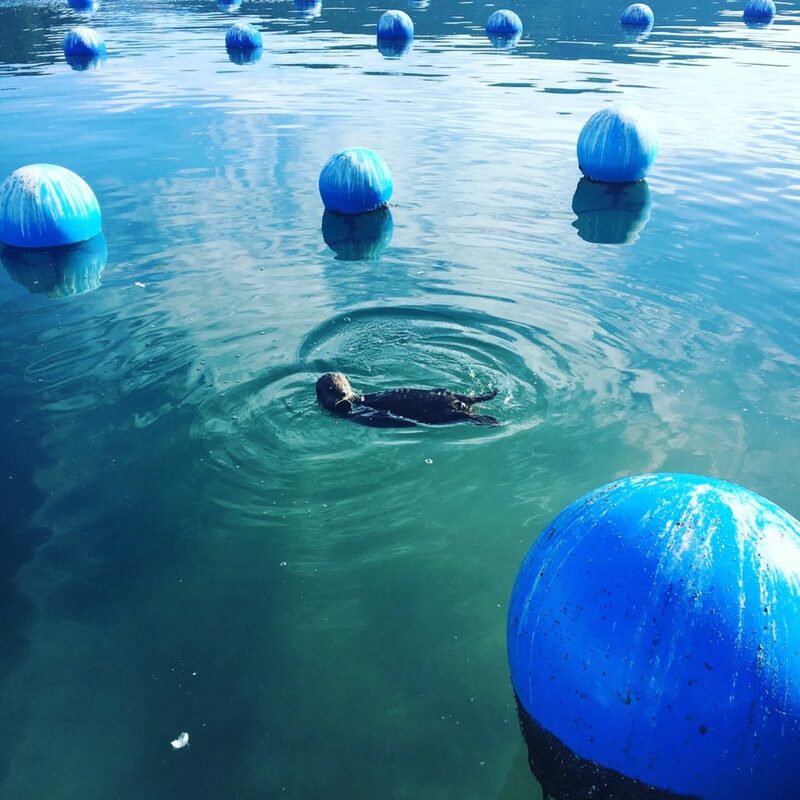 Rafts also provide quick escape for sea lions and seals when orcas are present. 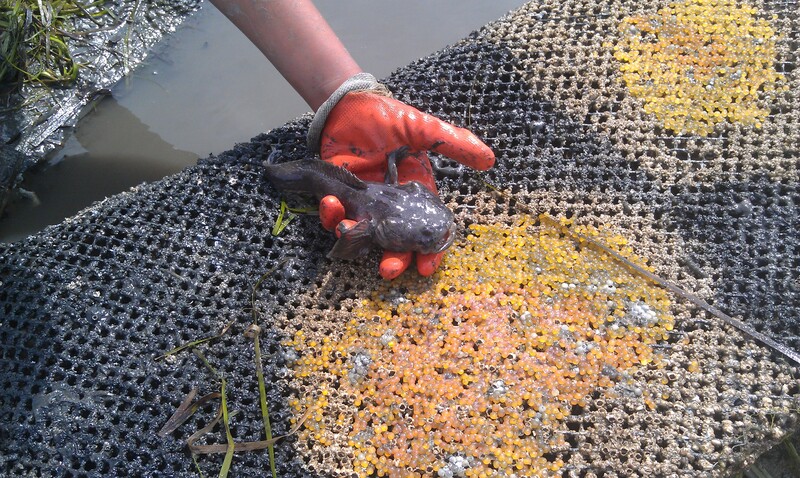 Attached is a pic of a male plain fin midshipman guarding the spawn on the underside of Drayton Harbor Oyster Co mesh growout bags. Steve says this is a somewhat recent phenomenon as their growout bags provide a hard protected surface which did not exist prior to DHO. Needless to say bags with spawn are left in place for 3-4 weeks. 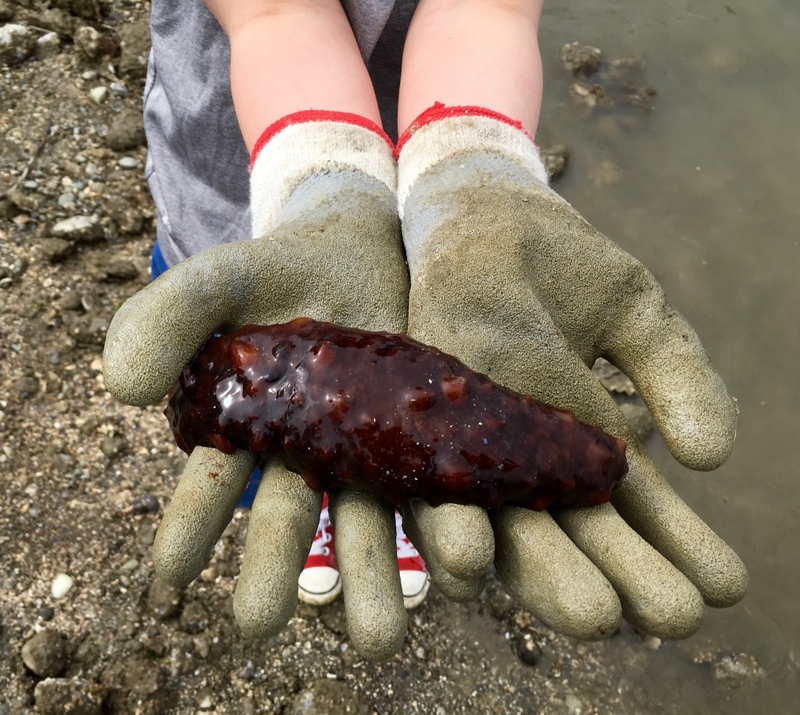 A Sea Cucumber (Actinopyga echinites) reclining in Dan's grandson's hands after being found under a grow bag on Hood Canal, near Union. Sea cucumbers serve a useful role in the marine ecosystem as they help recycle nutrients, breaking down detritus and other organic matter after which bacteria can continue the degradation process. Numerous small animals can live in symbiosis or commensalism with sea cucumbers, as well as some parasites. 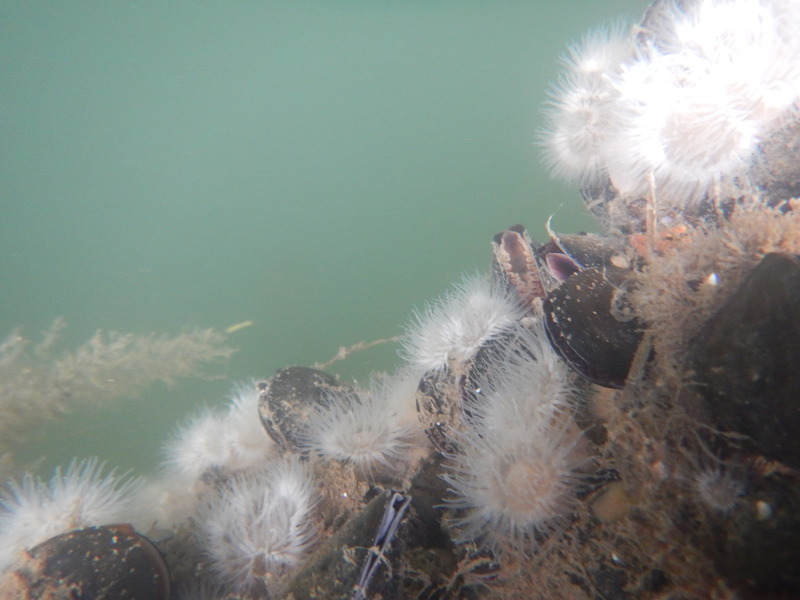 Emily's photo shows the blue mussels growing on longlines of mussel farms busily feeding. White sea anemones are growing with them. The mussels are sucking in sea water filtering out phytoplankton helping to keep phytoplankton blooms in check. You can see their mantles, the tissue just inside the shell, making a siphon to channel the water over the gills toward the mouth for feeding. 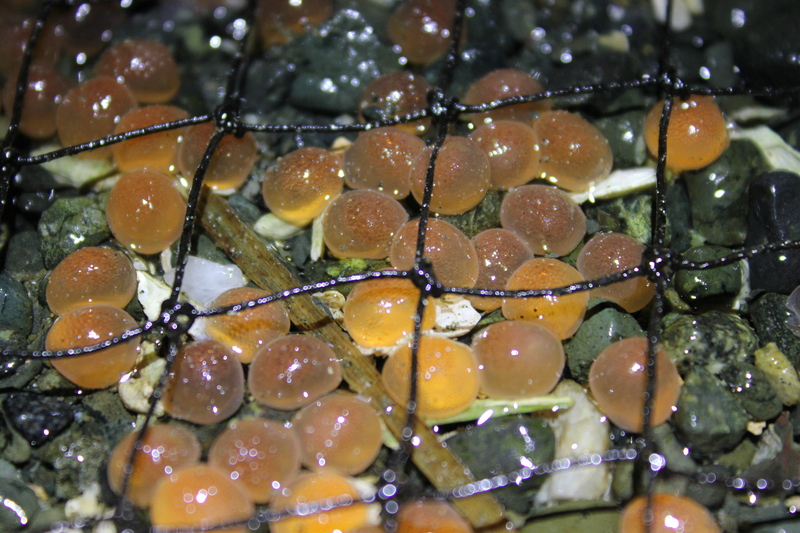 Bill's photo shows a variety of macroalgae growing on the pvc nursery tubes and net tops on his Fisk Bar geoduck farm in Samish Bay, WA. It also shows the eelgrass starting to fill back in around the tubes. 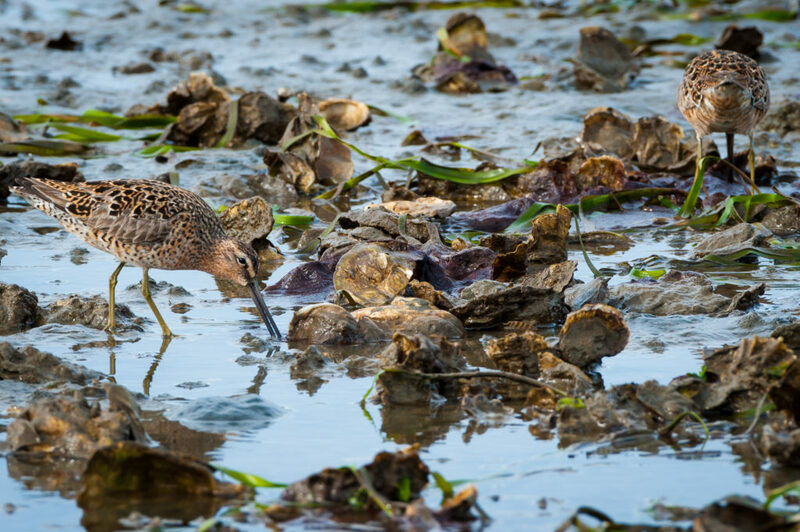 Here Bill shows Short Billed Dowitchers feeding in a complex of eelgrass and oysters at Goose Point Oysters in Willapa Bay, WA. This complex of oysters and eelgrass produces biofilms and habitat for numerous small prey items for foraging shorebirds.